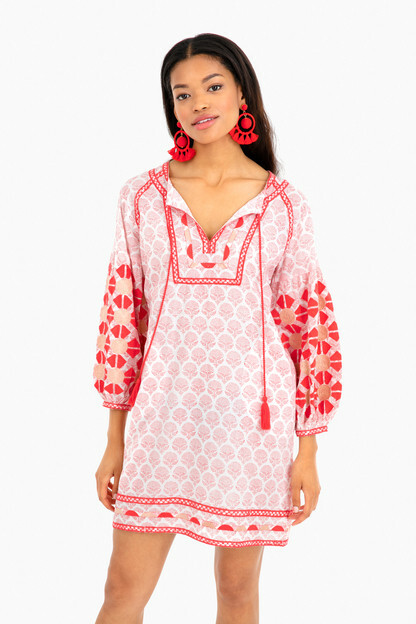 Newly discovered, Pink City Prints is a line of hand-made womenswear crafted by Artisans in Jaipur (the "Pink City"). In a bold pink with white embroidery, the Mexican Short Dress will add a boho-chic touch that is all tied together with a sash-tie at the waist. 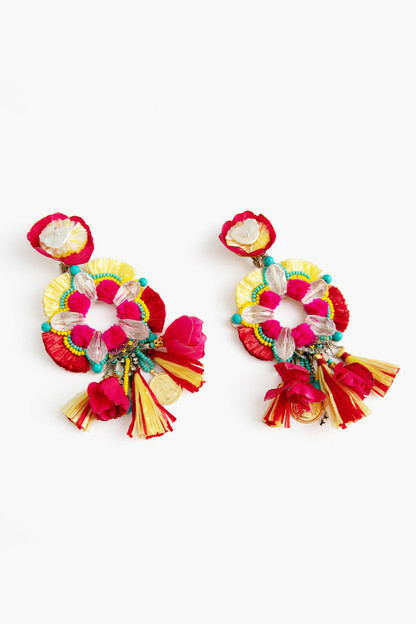 You will be ready to make the rounds at pool parties, tikki bars or date night! I bought this dress for an upcoming trip to Mexico and love it! It is a bit shorter than the photos show, and does run on the large side. I prefer mine without the belt, but the belt is a nice option to help define your waist. The pink color is really vibrant and pretty, and the embroidered details are high quality! Dress is gorgeous and super comfortable, it is a little shorter than it appears in the photo. It says it is dry clean only, but I washed it on delicate and hung dry and it did just fine. Overall, great dress! This dress is BEAUTIFUL! It really surpassed my expectations. 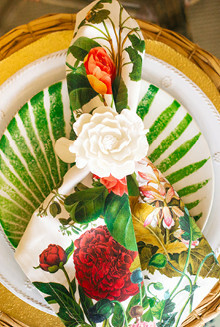 Gorgeous color and the embroidered detail is so nice. I highly recommend this dress! 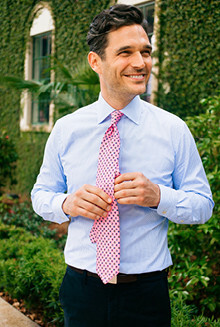 Great for casual outings and even Casual Friday work attire! 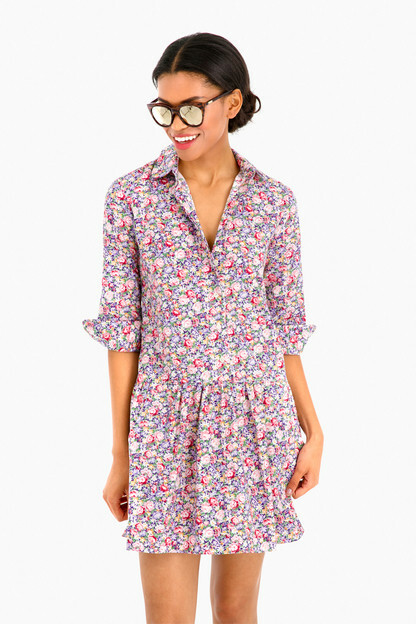 Perfect summer dress! Love it! Runs slightly big but still a good shape. I am a sucker for a blue dress, and this was no exception. The color and embroidery are beautiful. I got the x-small/small, and found it fit TTS (like it fits on the model). I really can't wait to find an excuse to wear this, its just so pretty. My one complaint is the price. 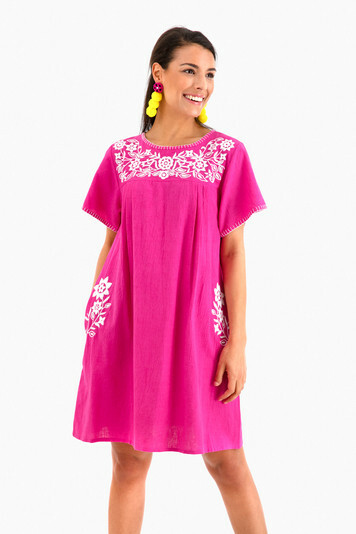 This is a cotton Mexican house dress. Let's be real. I understand that it's ethically hand-made, but the price is exorbitant. Unfortunately for me, I fell in love with this dress and couldn't find a similar one in this color/length, so I just had to get it. And even with the crazy mark-up, I can't regret my purchase, so that should tell you how much I love it. Very cute and flattering dress! This dress is well made, comfortable, and flattering on any shape. I love it so much I bought it in two colors. Color exactly as pictured! Nice dress will wear often! Perfect casual summer dress. Cool and comfy. I’ve received tons of compliments! I love the rich blue of this dress! It's slightly oversized so I can wear as a shift dress, or tie it with the belt when I want to accentuate my waist- either way it's a win-win! I was hoping to wear this as a shift or tunic dress. There is so much volume of fabric that it almost must be worn belted. It is super cute belted, just not the look I was going for.